Klobber Karnage is the third level of the Lost World in Donkey Kong Country 2: Diddy's Kong Quest. It can be accessed from the Klubba's Kiosk of Krazy Kremland after paying 15 Kremkoins. As the name implies, Klobber Karnage is dominated by Klobbers. Every type of Klobber is featured, including the green, yellow, and black ones, and their explosive variant, Kabooms. These enemies often appear in groups, attempting to push the Kongs into nearby pits or spikes. Many pits and large spikes appear in the level, and the only way for Diddy and Dixie Kong to cross them is by using Barrel Cannons. 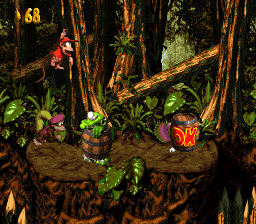 Near the end, the Kongs begin using Rotatable Barrels (on a short timer) for crossing pits. Numerous red and yellow Zingers are patrolling above the pitfalls, and about three times more of them appear in the level than Klobbers. At the start of the level, the Kongs must travel along the level and dodge a few Klobbers. Then, they will have to cross several large spike-filled pits. After they cross these gaps, the Kongs must face more Klobbers, including yellow banana-stealing ones. Next, the heroes must jump in either the Diddy or Dixie barrel to be launched to a set of barrels. With careful aim, they should make their way to the other side of the abyss. From there, they will need to cross a gap and fight off several more Klobbers, with some even stealing lives. After getting over a few more gaps, the Kongs will have to travel up to another abyss and cross it by using barrels. The monkeys will have to shoot into a Diddy or Dixie Barrel (depending on which Kong is in the lead) and continue to blast over the spikes below. Soon, they will land on a small platform, and have to hop right back into another barrel. They must shoot through the many barrels and eventually get to the other end of a wide abyss. Here, they will find the Star Barrel. Halfway through the level, the heroes must jump over two small gaps and watch out for a few Klobbers and Kabooms. They will then have to hop into another barrel and begin to shoot into the following barrels after it. This time around, the abyss that must be crossed is much wider than the before ones, and Zingers can be found more often around each barrel. After shooting over some Zingers, the group will finally get to the other side and have to dodge a few Kabooms and Klobbers. After that, they will need to choose either a Diddy or Dixie Barrel to start shooting over another spike-filled abyss. Obstacles are placed more frequently over this pit. The heroes will make it to the other side after shooting over several Zingers. At this point, they will have to hop over some spikes to reach some ledges. As they watch out for gray Klobbers on the ledges, they must climb up and find the End of Level Target. When they hit it, they may exit the level. At the very end of the level, the Kongs should pass up the End of Level Target and find a lone banana above them. They can use the Team Up move to throw a Kong to the banana, or simply use the Diddy barrel. If they do so, they will land right into a hidden Bonus Barrel. In the Bonus Level, they must defeat several Zingers. However, they are all above an abyss filled with sharp spikes. The Kongs' only option is to touch the Invincibility Barrel and become temporarily invincible. They can then run over the spikes and defeat all the Zingers, but before the special ability wears off. After all the enemies are gone, the DK Coin will appear. 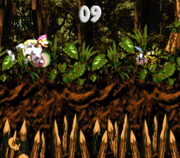 After a few spike pits near the start of the level, Dixie must jump into a Dixie Barrel to launch herself at the K. The K also may be obtained by simply jumping towards it. Directly after the first black Klobber of the level, the O is seen floating above a pit. Dixie should jump down the pit to grab the letter, as there is a Dixie Barrel that launches her back up. While riding in a Rotatable Barrel, the Kongs have to launch themselves under three Zingers. The N is found directly after this section. While riding in the second moving Rotatable Barrel, the G can be obtained by launching up to it after dodging two Zingers. DK Coin The DK coin is located at the end of the level's only Bonus Area. Golden Feather (GBA version) The Golden Feather is found between a pillar at the very end of the level. Photograph (GBA version) After the Star Barrel in the second half of the level, the Kongs should find a Kaboom with a camera icon over its head. If they jump on this enemy and destroy its barrel, they are rewarded with a photograph, giving them another picture for their scrapbook. Dixie near the Letter O.
Dixie prepares to throw a barrel at a yellow Klobber. Zingers around a Rotatable Barrel. Diddy is about to jump on a black Klobber. The start of the level in the Game Boy Advance remake. The Kongs encounter numerous Klobbers in the Game Boy Advance remake. 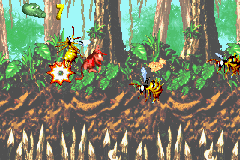 Like Jungle Jinx, the Bonus Area's colors were changed between the two versions of the original Super Nintendo Entertainment System release.